Have you ever hoped for a sign? Yesterday, though, I felt a different kind of hope — an urge to become someone else’s sign. So I drove to the store and bought a composition notebook — you know, the kind with a stiff cardboard cover marbled in black-and-white. (You’ve been asking for a sign. As soon as I’d written the words down, I knew they were right. 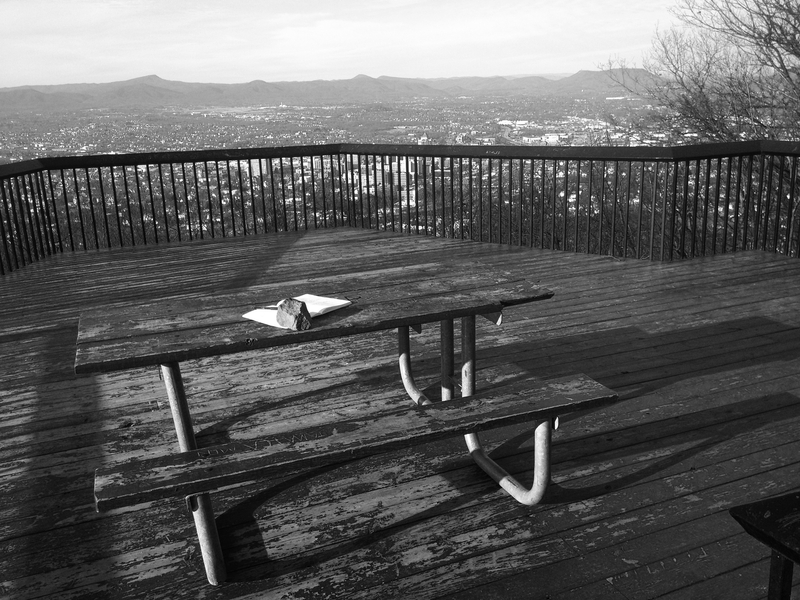 So I got back in the Xterra and climbed to the top of Mill Mountain, not far from the famous star overlook. If you’re not familiar, there’s another overlook there, a little smaller and farther down the hill, with fewer footprints surrounding it, but still, the view of the city is just as stunning. And right there on the platform is a picnic table. You could sit down at that table and see all the way out past Salem, past Dixie Caverns, almost to the New River Valley. If you were seated there to write, you could glance up from the page and take it all in with just the briefest flick of your eyes. You wouldn’t even have to pause your pen. That was the best spot I could think of to leave a notebook full of blank pages. When I first got out of the car, the wind nearly took me off my feet; it must have been one of the coldest and fiercest days of the year. That meant I had the place to myself, which is what I wanted. I stepped onto the platform, opened the notebook and placed it right in the middle of the table, where anyone could read the words. I weighted it down with a rock. Then I snapped a few pictures and turned to go, breathing a prayer as I went. I was praying for the right person to find these words. But in a way, I was praying for you, too. Do it now — I dare you.